Resource files are configured as MSBuildResource items and are compiled into assemblies. 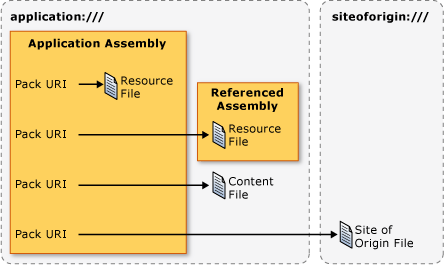 WPF supports the construction of pack URIs that can be used to identify resource files that are either compiled into the local assembly or compiled into an assembly that is referenced from the local assembly. XAML files that are configured as MSBuildPage items are compiled into assemblies in the same way as resource files. 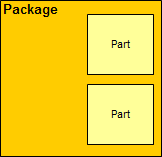 Consequently, MSBuildPage items can be identified using pack URIs for resource files. 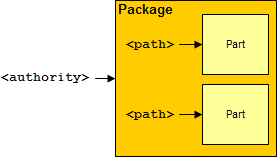 The format of pack URIs makes it possible for pack URIs for different types of files to look the same. For example, consider the following absolute pack URI. Resource file - local assembly "pack://application:,,,/ResourceFile.xaml"
Resource file in subfolder - local assembly "pack://application:,,,/Subfolder/ResourceFile.xaml"
Resource file - referenced assembly "pack://application:,,,/ReferencedAssembly;component/ResourceFile.xaml"
Resource file in subfolder of referenced assembly "pack://application:,,,/ReferencedAssembly;component/Subfolder/ResourceFile.xaml"
Resource file in versioned referenced assembly "pack://application:,,,/ReferencedAssembly;v1.0.0.0;component/ResourceFile.xaml"
Content file in subfolder "pack://application:,,,/Subfolder/ContentFile.xaml"
Site of origin file "pack://siteoforigin:,,,/SOOFile.xaml"
Site of origin file in subfolder "pack://siteoforigin:,,,/Subfolder/SOOFile.xaml"
Resource file in local assembly "/ResourceFile.xaml"
Resource file in subfolder of local assembly "/Subfolder/ResourceFile.xaml"
Resource file in referenced assembly "/ReferencedAssembly;component/ResourceFile.xaml"
Resource file in subfolder of referenced assembly "/ReferencedAssembly;component/Subfolder/ResourceFile.xaml"
Content file in subfolder "/Subfolder/ContentFile.xaml"